The Haunted Mansion at Walt Disney World was one of approximately 20 attractions that were in existence when the Magic Kingdom first opened on October 1, 1971. It has undergone some changes over the years but remains basically the same as it did in 1971; a mostly funny/slightly scary version of a haunted house. It would be difficult to find a guest who has visited the Magic Kingdom and not experienced the Haunted Mansion. The ride is a favorite of many, including yours truly. This blog will discuss some of the more obscure facts about the attraction, (and a few that might be more well-known). Everything at Walt Disney World has a story behind it, and of course, the Mansion is no exception. Through the years the story has altered a bit. 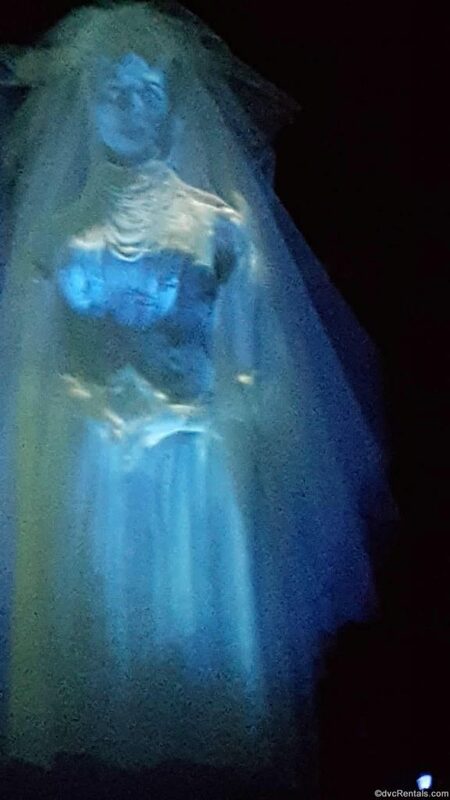 The current story is that the “Black Widow Bride” aka Constance, (who we see in the attic of the attraction at Walt Disney World), murdered a number of husbands in her search for the wealthiest one. If you look carefully at the portraits you pass by in the attic you will notice that the bride has one set of pearls on her neck in the first portrait. With each additional portrait the number of strands of pearls increases, and as we pass each portrait the groom’s head disappears. Finally, we see Constance, with a creepy expression on her face, holding an axe and, speaking in an eerie voice, saying wedding vows as murderous puns. For example, “I do, I do, I did”, and “In sickness and in wealth”. 1. When the Mansion first opened, there was no cover over the queue line, leaving guests waiting in the Florida sun. It wasn’t until a number of years later that the awning was added. A. 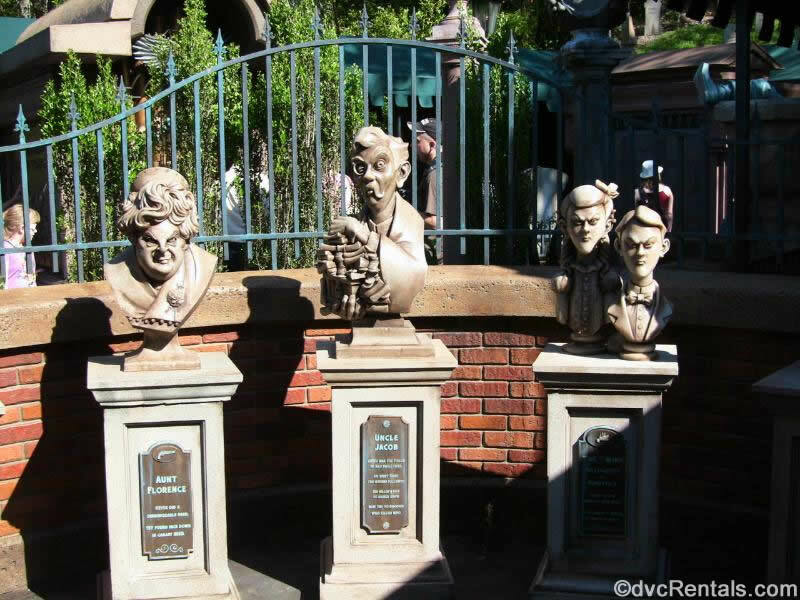 The Dread Family, the busts you see as you first enter the new area. If you read the epitaphs on the busts it becomes clear that this family murdered one another. B. A crypt adorned with musical instruments. Guests can bring the instruments to life by touching any of them. C. An old tomb that contains a Sea Captain. Water spews from the tomb, and if you time it right (or wrong, depending on your feeling about getting wet) you may get squirted as you go by. D. There is a small narrow tomb with a book inside of it. You will hear a voice coming from the tomb, and as words appear in the book the voice will encourage you to find a word that will complete a series of macabre rhymes. E. A “Secret” Library with books that will randomly come out of the wall, guests can push them back in a la whack a mole. Additionally, the books have a cryptogram inscribed on them. If you are good at solving puzzles you will realize that the various symbols on the books all represent a different letter. I don’t want to spoil the solution for anyone, so that’s all I will say in this blog. If you are really curious but don’t have the time to figure out the solution, you can find it online using any search engine. F. There is a scary looking pipe organ with skeletons on top of the pipes. Another place to beware if you want to stay dry, the keys will spray a mist at you if you touch them. 3. 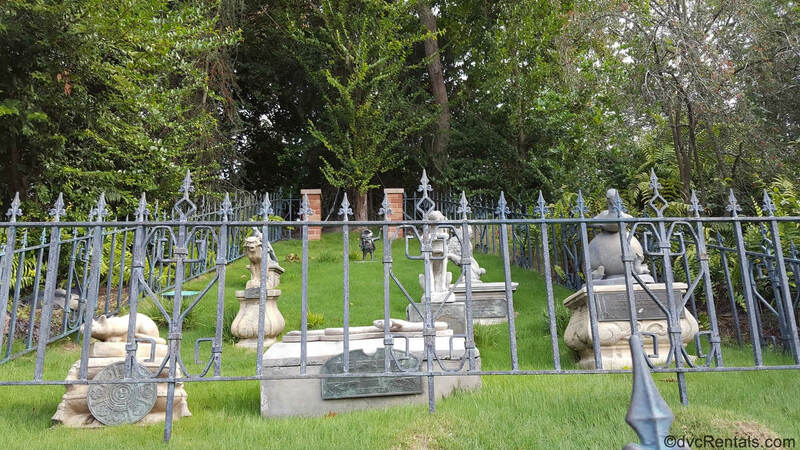 Once you leave the interactive graveyard you will exit that area and pass another graveyard on your left before entering the Haunted Mansion. 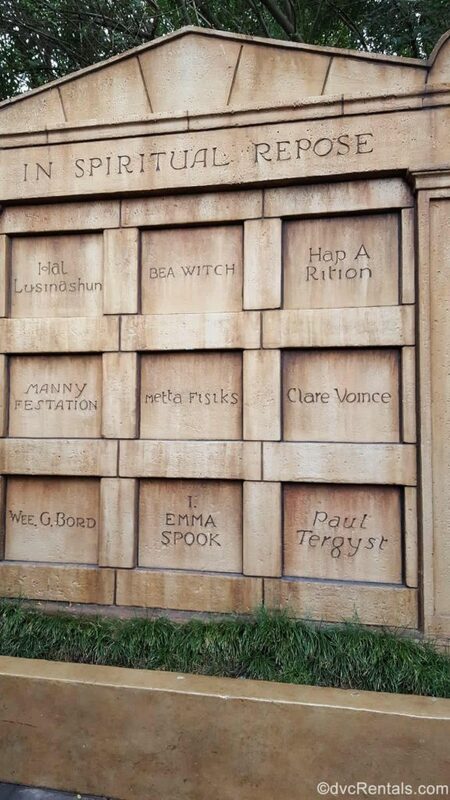 At the end of this graveyard you will see a tomb that says Madame Leota. (She is also inside the Mansion, the floating head you see just before you enter the ballroom scene. Her voice is done by the same woman who voiced Maleficent in Sleeping Beauty and Lady Tremaine in Cinderella, Eleanor Audley.) 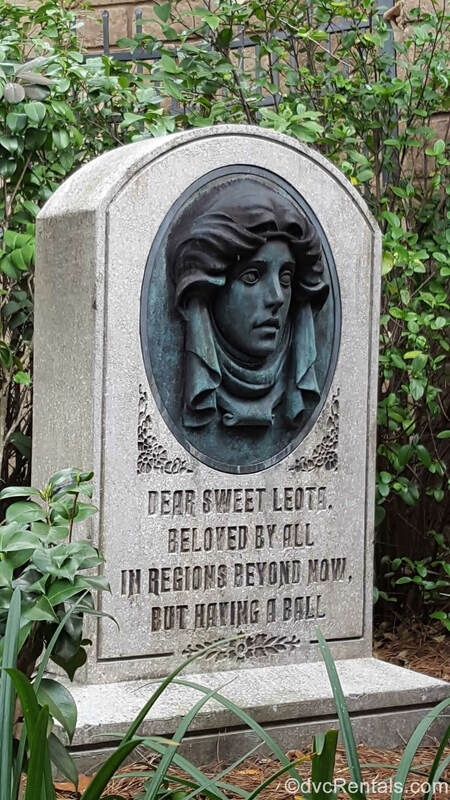 Look closely at the Leota tomb outside and you will see that Madam opens her VERY green eyes occasionally, and her head will move back and forth against her tombstone. 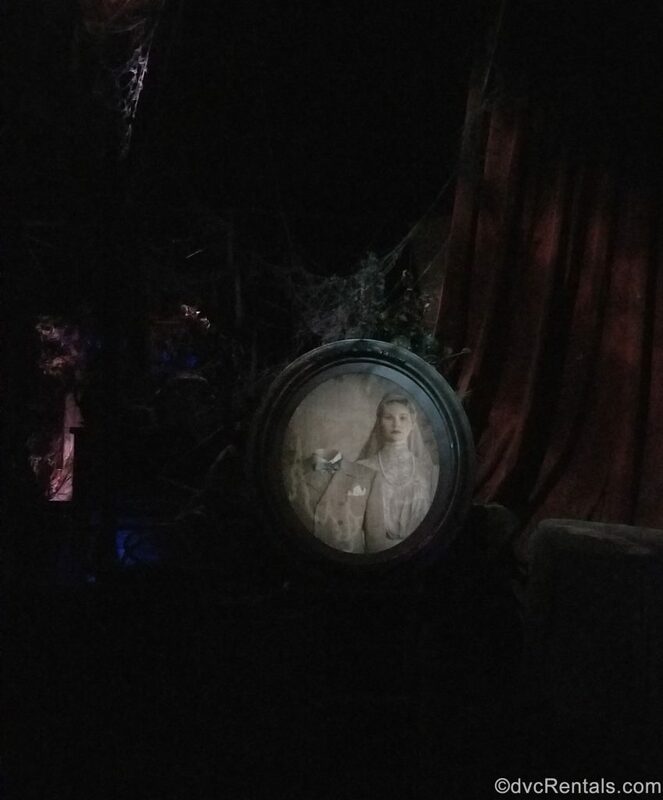 At the very end of the ride, the small figure on the upper right just before you disembark –the one who says “Hurry back, be sure to bring your death certificate if you should decide to join us” is known as Little Leota. 4. 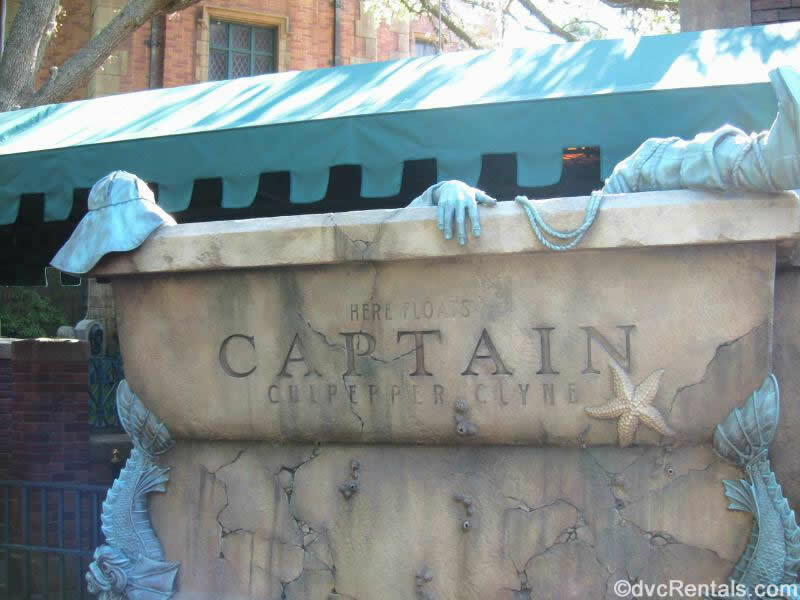 The hitchhiking ghosts always were a part of the end of the ride, joining you in your Doom Buggy. But originally one would just be sitting next to you in your Doom Buggy (that’s what the ride vehicles are called). This changed a number of years ago to the current version, where one of the ghosts will “haunt” your vehicle in a number of creative ways. For example, if you are riding with another guest the ghost might change your heads from one body to the other! Solo or with another guest, they might take your head off, blow it up like a balloon, and then let the air out until your head disappears. The ghost might lie on your Doom Buggy and shine a lantern. There is special technology to determine if there is one or two people in your party to enable the best effect. It’s always fun to see what “tricks” the ghosts are up to, as there are a number of varieties. 5. The ghosts have names! They are Ezra (the skeleton), Phineas (the Traveler) and Gus (the prisoner with the ball and chain). 6. The haunted staircase with the green footprints was not always part of the attraction. Formerly that area had a plain staircase lined by two huge glowing spider webs. They looked exactly the same as the spider web you see when you go through the dark tunnel on the Jungle Cruise attraction in Adventureland at the Magic Kingdom. 7. 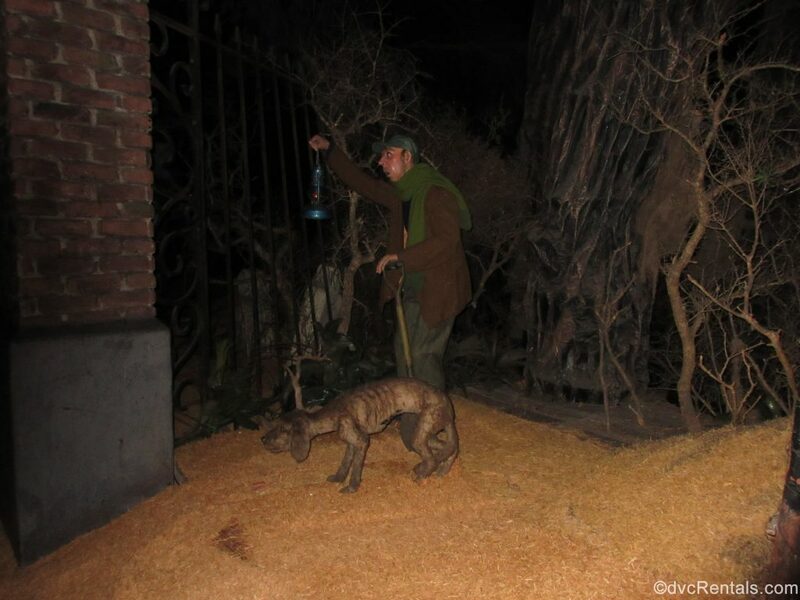 The dog with his ribs sticking out who is accompanying the gentleman with the lantern as we enter the final graveyard scene, is named Bony. 8. Paul Frees, the “Ghost Host” was a very well-known voice talent in his day. His is the original voice of the auctioneer in the Pirates of the Caribbean attraction scene, as well as that of the Pillsbury Doughboy! 9. In case you never noticed, when you first come into the mansion, before you go into the “stretching” room, there is a portrait hanging on the wall. This portrait will change from a young man, to an old man, to a skeleton if you keep your eye on it. 10. Helpful hint: There are two stretch rooms, one on each side of the portrait mentioned above. If you want to be one of the first guests to leave the stretch room, stand on the right side of the room if you enter the left-hand stretch room and stand on the left side of the room if you enter the stretch room to the right of the portrait. 11. The Disneyland version of the Haunted Mansion looks very different than the one at Walt Disney World. It resembles a Southern Mansion at Disneyland, where at Walt Disney World it’s a gothic style. 12. 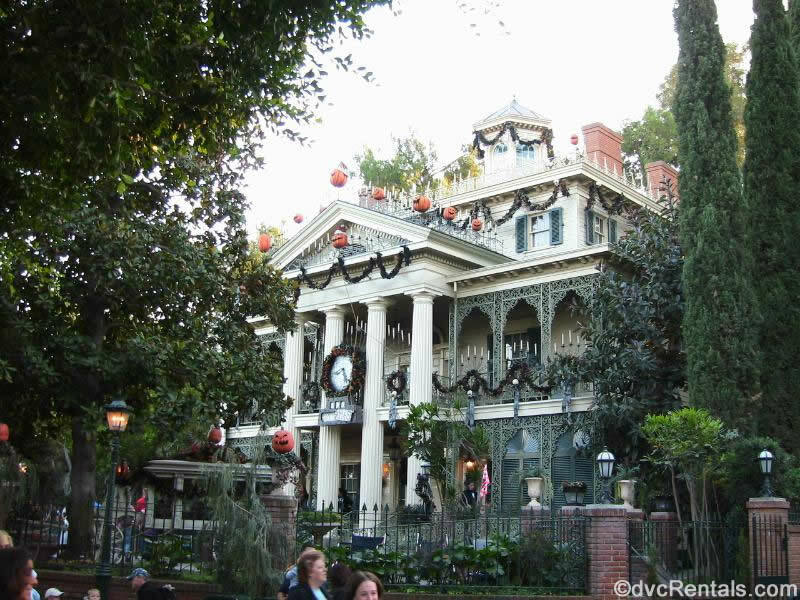 Disneyland in California and Tokyo Disneyland have a special makeover of their mansion during Halloween. It’s based on the movie The Nightmare Before Christmas, and you will see many characters from, as well as references from the film if you visit during the months that it’s in Halloween mode. 13. 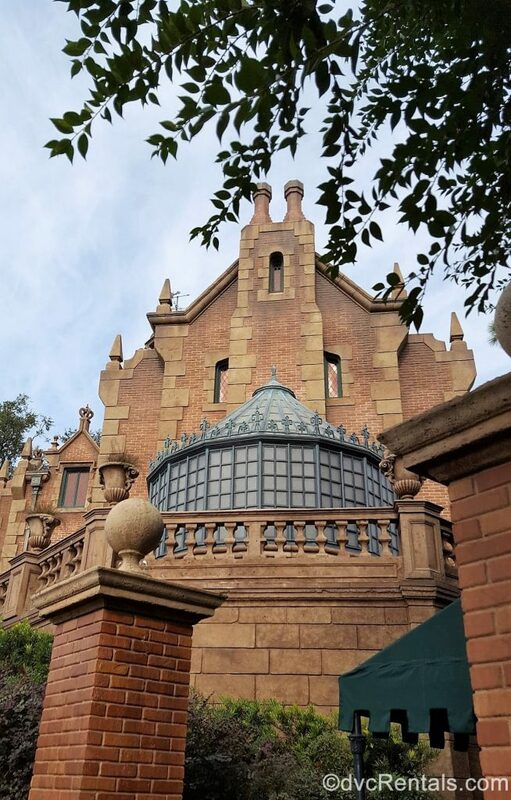 Disneyland Paris has a way scarier Haunted Mansion than the ones in Florida and California (which are more funny than scary, although some small children might be fearful). 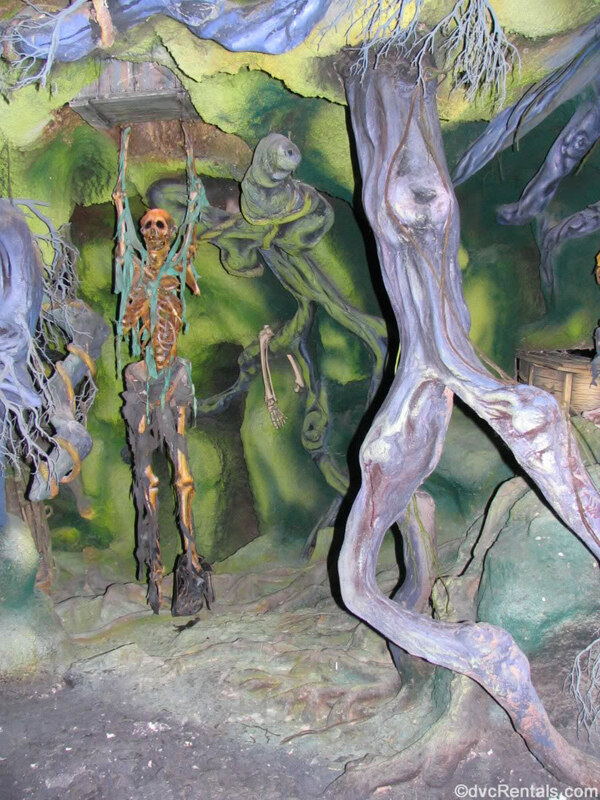 Known as Phantom Manor, there are lots of creepy skeletons and frightening scenes that will almost definitely scare little ones. 14. The cast members who run the attraction are dressed as butlers (men) and maids (women). They almost always stay in character, and will stare you down with an evil look. Don’t expect any smiles from the Cast Members on this ride! 16. During Mickey’s Not So Scary Halloween Party the mansion has a very cool Ghost who sits on the lawn next to the attraction queue and interacts with guests as they pass by. 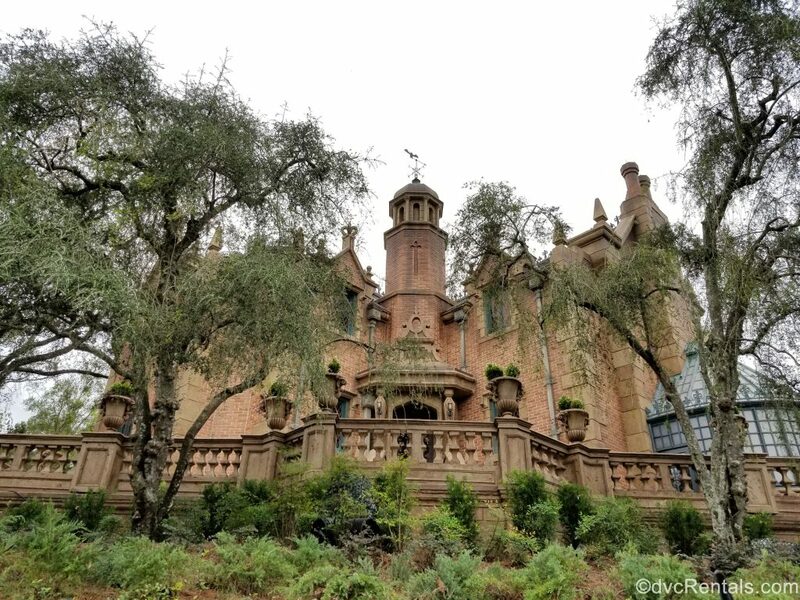 Additionally, a slower and creepier version of the music that you hear in the Mansion sung by the busts towards the end of the ride (the name of the song is Grim Grinning Ghosts) can be heard throughout the park on the party days. 17. As you exit the attraction notice the crypts on the left side. If you read the words, they are all very punny. 18. Continuing past the crypts mentioned above, you will turn left to get back to the rest of the Magic Kingdom. As you turn you will see an animal graveyard, including a statue of Mr. Toad (from the extinct ride in Walt Disney World’s Fantasyland, now the home of Winnie the Pooh). Mr. Toad is still running at Disneyland by the way. 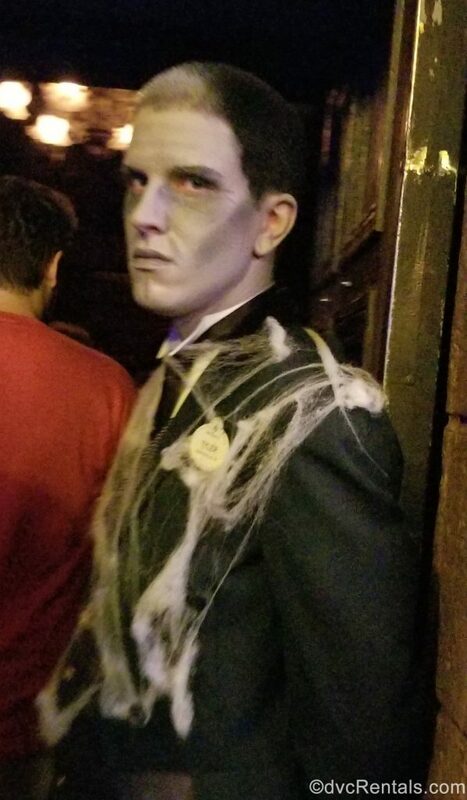 I hope next time you experience the Haunted Mansion you will now have new-found knowledge that will help you enjoy this attraction even more. If it’s busy, a Fast Pass is recommended, but on most days the wait will be 30 minutes or less. Have fun and Beware of Hitchhiking Ghosts!